Some nonprofits are taking robust measures to combat the epidemic of foreclosures, also known as REO (for "real estate owned") homes. Three of them, Rebuilding Together, NeighborWorks America and the National Community Stabilization Trust, recently announced a new partnership designed to ramp up efforts to revitalize clusters of bank-owned foreclosures, highlighting what appears to be a growing focus on maintenance as a means to mend the housing market. NeighborWorks America, which coordinates with affiliates that were awarded more than a total of $500 million from the $7 billion Neighborhood Stabilization Program fund in 2010, is teaming up with local affiliates of the nonprofit Rebuilding Together to train the groups to rehabilitate vacant foreclosed homes and sell them to low-income Americans. The National Community Stabilization Trust, which was created in 2008 to facilitate the transfer of bank-owned homes to nonprofits, will work with the two groups to identify homes that will receive repairs under the program. "This is a unique effort in that it's focused on transforming vacant and dilapidated properties into safe and affordable homes in the communities they serve," Rebuilding Together spokesperson Janice Walker told AOL Real Estate. The announcement of the collective nonprofit initiative marks one of the latest attempts to reduce the strain of neglected foreclosed homes on neighborhoods and the housing market. Nonprofits, banks and the government use rehabilitation to combat REO blight, and sometimes provide affordable housing to low-income Americans after the homes' restoration. They've appeared to bolster their efforts in recent months in order "to figure out how to move upstream," says Ascala Sisk, senior manager of Stabilization Strategies at NeighborWorks. And there are "many different structures" to use to accomplish this. 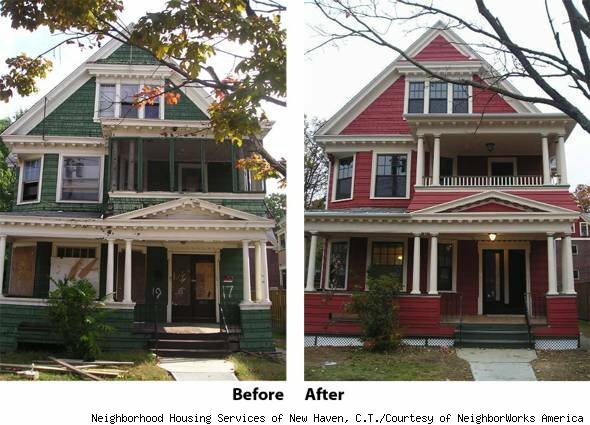 For nonprofits, the Neighborhood Stabilization Program plays a key role in rehabilitation efforts, furnishing them with the necessary funds to invest in mass-scale neighborhood revitalization, which often takes the form of REO rehabilitation. The Department of Housing and Urban Development administers the fund, which has received $7 billion in appropriations so far, Sisk says. And the National Community Stabilization Trust, one of the three partners of the new nonprofit initiative, helps put these funds into action by "providing the only nationwide platform that gives local housing providers a clear, consistent, and straight path to acquire foreclosed and abandoned properties from financial institutions," the National Community Stabilization Trust's website says. NeighborWorks America affiliates across the country helped homeowners rehabilitate more than 8,700 homes and 43,000 rental homes in 2011, group spokesperson Douglas Robinson says. 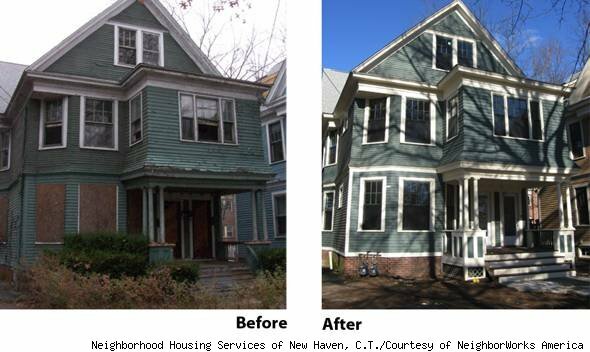 With NeighborWorks guidance, Rebuilding Together, which purportedly completes 10,000 projects that assist low-income homeowners per year, is now beginning its first foray into REO rehabilitation. Rebuilding Together's plan is to rehabilitate REOs and sell them to community members who make between 80 and 120 percent of the local median income, and also provide them with homeownership education, Walker says. Since the partnership has just formed, Rebuilding Together says that it can't provide an estimate of how many homes the program will impact. Coinciding with the two nonprofits' newly formed partnership is another program launched in February that takes an alternative approach to combating REO blight. Under the REO Rental Initiative, the Federal Housing Finance Agency will sell Fannie Mae and Freddie Mac-owned REO properties in bulk to private investors, if they agree to rent the properties. By mandating that the properties be converted into rentals, the program aims to lower rents where foreclosures have hiked up rates and provide the homes with caretakers who are motivated to maintain them, namely, the investors themselves. After a few years of renting (and maintaining) the once-dilapidated properties, investors are expected to push the homes onto the market and sell them. The program has its critics, including the National Association of Realtors. Detractors say that selling in bulk to investors could chip away at home prices (private investors often buy homes at discounts because they pay banks in cash, not borrowed money) and encourage prospective buyers to rent, instead of buy. "Over time, servicers have adjusted their models to accommodate selling properties quickly rather than holding onto potentially wasting assets," the 2010 Federal Reserve report on neighborhood stabilization says. "At times this may mean selling to a cash investor immediately, at a slightly lower price, instead of waiting for a prospective owner occupant to receive financing for the purchase." Bank of America has launched a similar pilot program, called the "Mortgage to Lease Program," that forgives the outstanding debt of some homeowners headed toward foreclosure and offers them the opportunity to rent their homes from Bank of America in exchange for handing over the titles to the bank. If homeowners opt for the program, they may rent for up to three years. "If this evolves from a pilot into a more broadly based program, we also see potential benefits from helping to stabilize housing prices in the surrounding community and curtailing neighborhood blight by keeping a portion of distressed properties off the market," Ron Sturzenegger, a servicing executive of Bank of America, said in a statement. For all the two programs' possible shortcomings, they reflect a growing interest across the real estate industry in finding innovative ways of ameliorating the housing crisis by attending to the REO threat, Sisk says. "And that's great to see," she says. An earlier version of this story misidentified a Rebuilding Together spokesperson. The spokesperson's name is Janice Walker. The story also incorrectly stated that Rebuilding Together's rehabilitation plan is to restore REOs and sell them to community members who make between 80 and 20 percent of the local median income. The income range is actually 80 to 120 percent of the local median income.